Challenges: Design a house like you would like to live in. Build a house with friends. 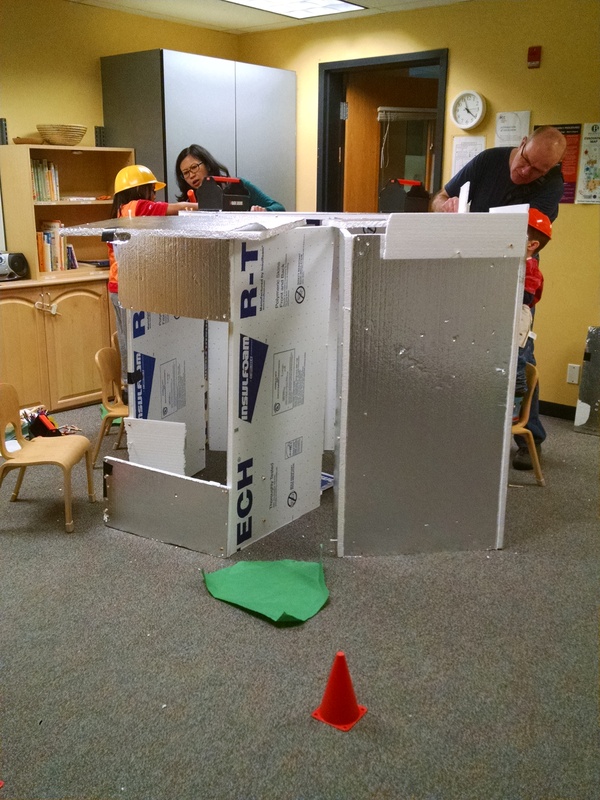 Incorporating Books into the Lesson: We had three different books that are about the process of building a house. Building a House by Barton is a nice book for ages 3 to 5 about each of the steps in building a house. 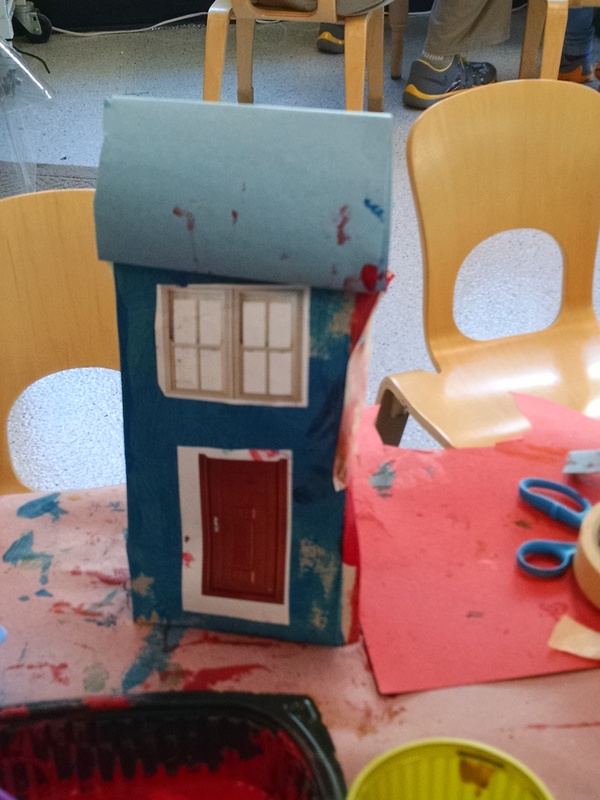 Building Our House by Bean is great for ages 4 to 6. It tells the story of a family building their own house. Told from the perspective of a young child. How a House Is Built by Gibbons. I find some of the details in this book are more than a child would care about, but the illustrations are good. We photocopied and printed copies of many of the pages, and posted those pictures near the activity related to that step in the book. Here is a pdf of the pages from Barton. (Note: I have an alternative lesson plan for building a house that is all tightly focused around the Barton book, with activities to match virtually every page. Check it out here.) We later used these books in circle time, where they wove together the story of the separate activities into a whole process. Build a House! This is one of my all-time favorite collaborative activities for kids age 3 – 7. I first saw it at a construction themed birthday party. (Read more here: https://gooddayswithkids.com/2014/12/18/kids-construction/.) 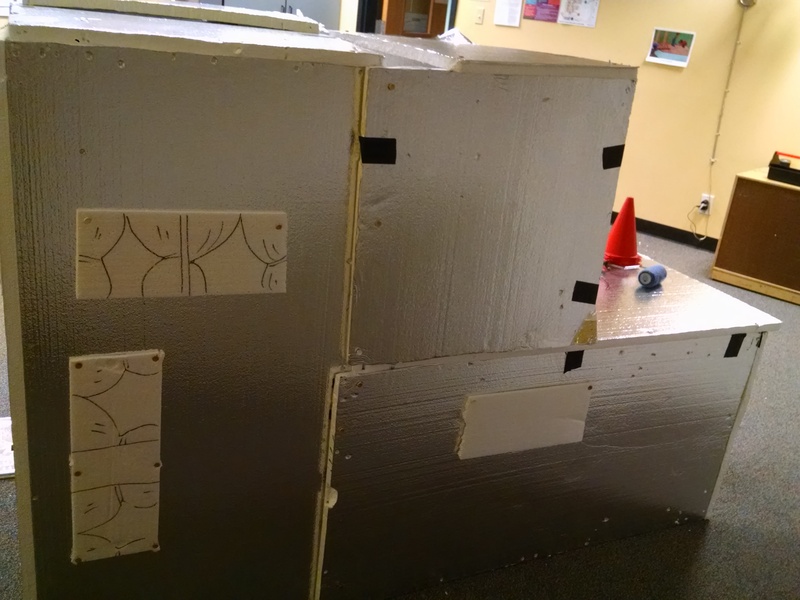 You use foam insulation panels (we use the 1 inch by 2 foot by 4 foot panels from Home Depot – for this class, I had nine full panels, plus a few cut into halves and thirds. Most were re-used from the last time we did this project) plus golf tees and toy hammers to assemble a building. 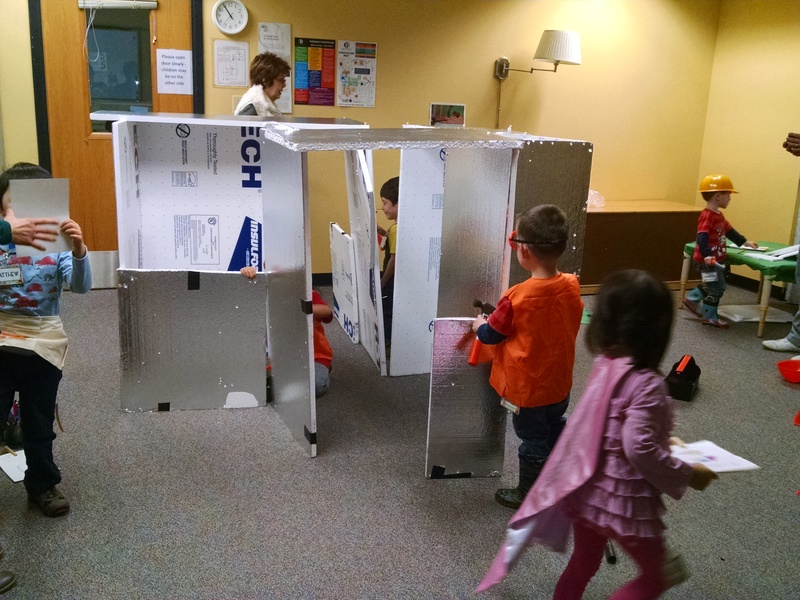 You can use the panels horizontally like they did at the party – the advantage to that is kids can work more independently or you can use them vertically to make a 4 foot tall building – the advantage is kids can stand up inside it, but they’ll need adults to help them put together the first few tall walls, and they’ll likely want to climb on chairs to do some of the work. Kids LOVE to hammer and feel like they’re building “something real.” It can keep them entertained for hours. We also gave them small pieces of Styrofoam to nail on as windows and other accessories. You could give them a Sharpie to draw on the panels, but I want to be able to re-use them, so I don’t. This is a great activity for any preschool class or for a birthday party, and it’s pretty cheap – about $30 in Styrofoam, $4 in golf tees, and you can ask all the guests to bring their own toy hammer or mallet (just have a few extras just in case.) And when you’re done, you have insulation panels for a crawlspace or attic – with just a few holes in them :-). 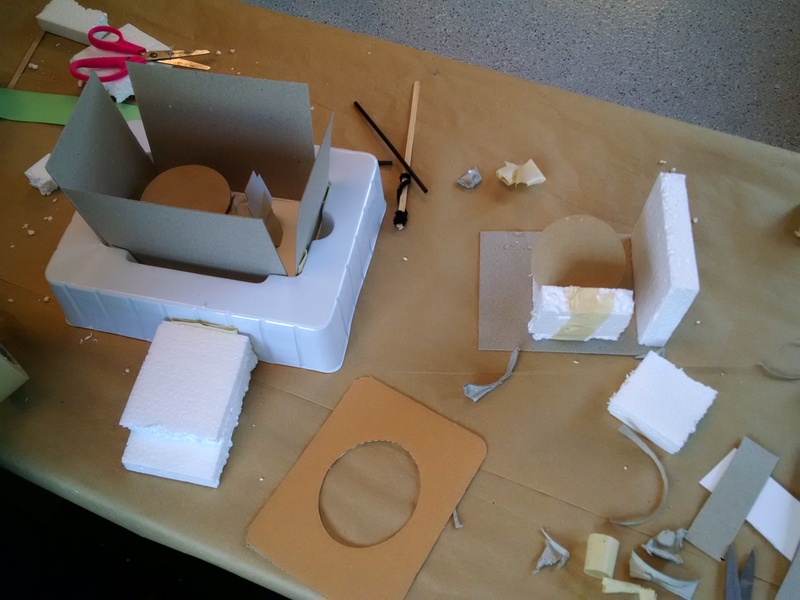 Art Project – Paper Bag Houses. We got the idea from Kids Activities Blog, but we used white bags and markers and dot paints (bingo markers) instead of paint, so we didn’t have to wait for them to dry. Build a Neighborhood. 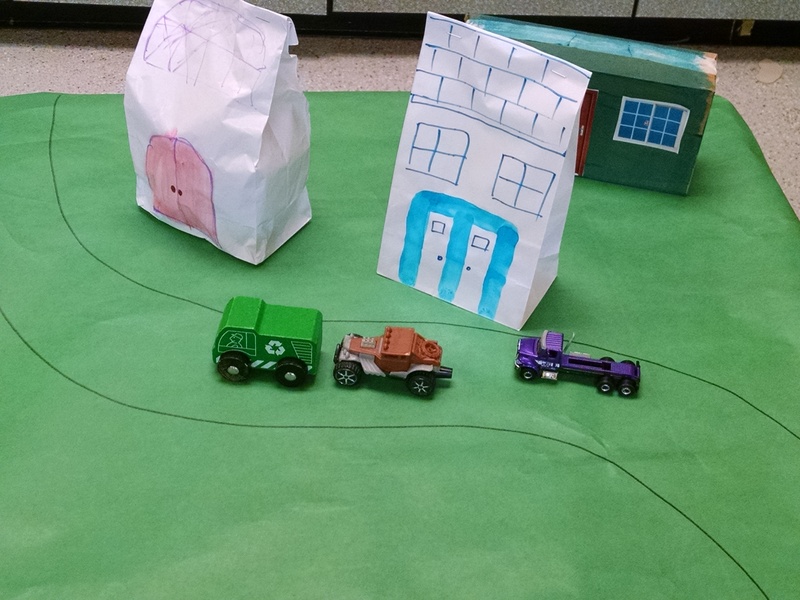 If we had more time, we would have set up a neighborhood – taped out roads on the carpet, and let kids line their paper bag houses and cardboard houses along the street, add cars and dolls and so on. 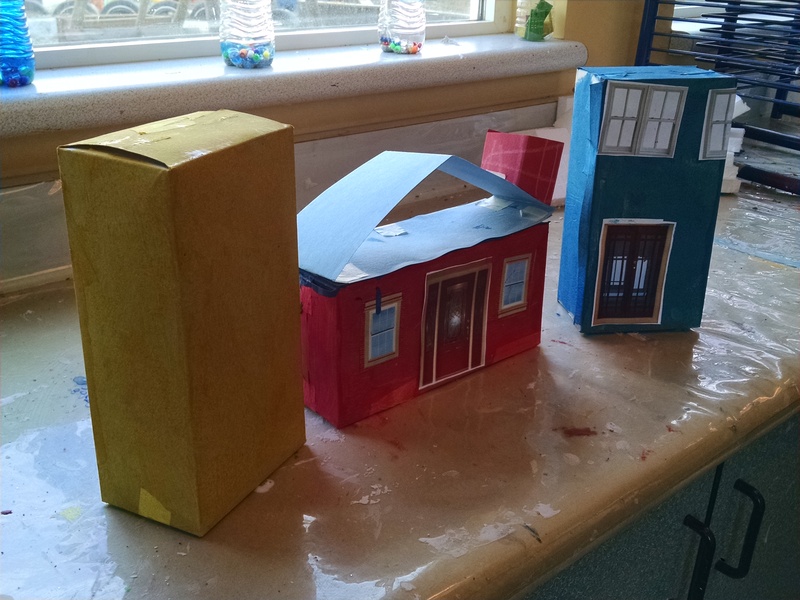 Since our time is limited, and the painted houses wouldn’t be dry in time to play with them, we just set up a little table top play with a couple of paper bag houses. 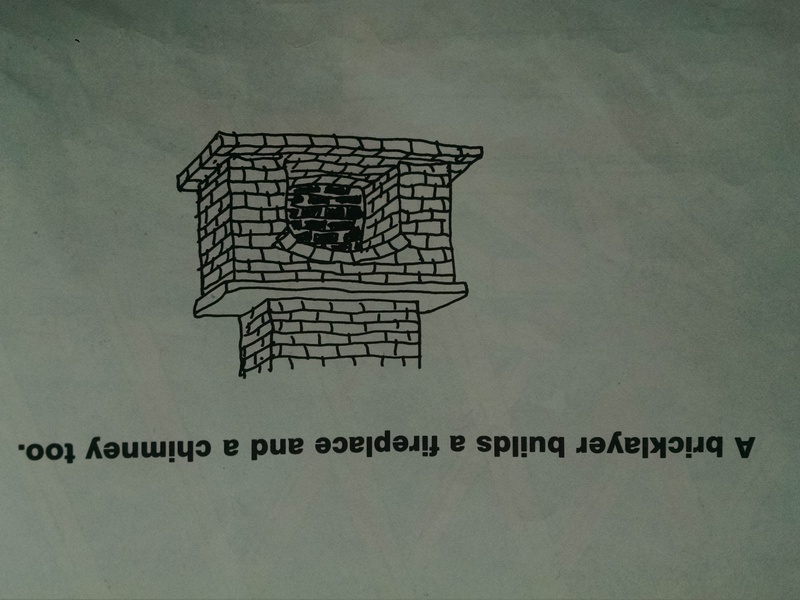 Brick-Laying: We had Duplos and Mega Blocks and a drawing of a fireplace and chimney from the Barton book. 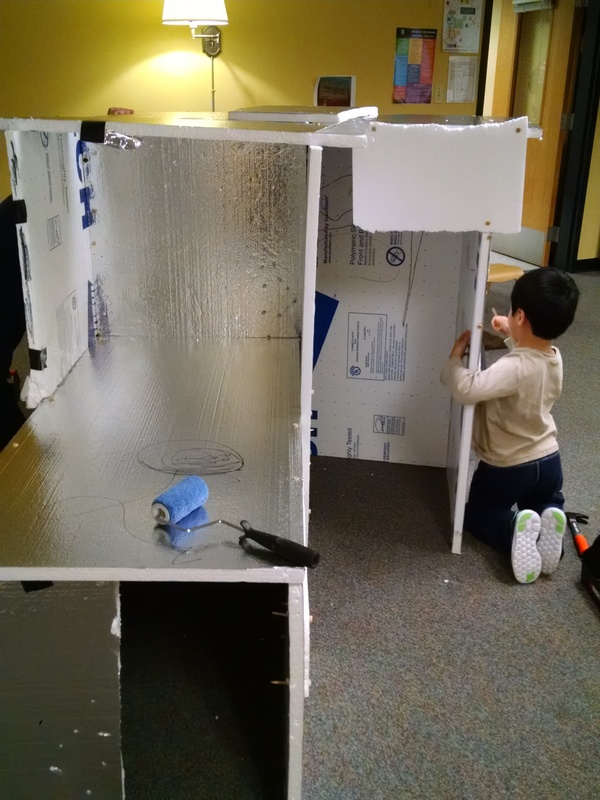 Kids could build whatever they wanted – a few tried the fireplace. 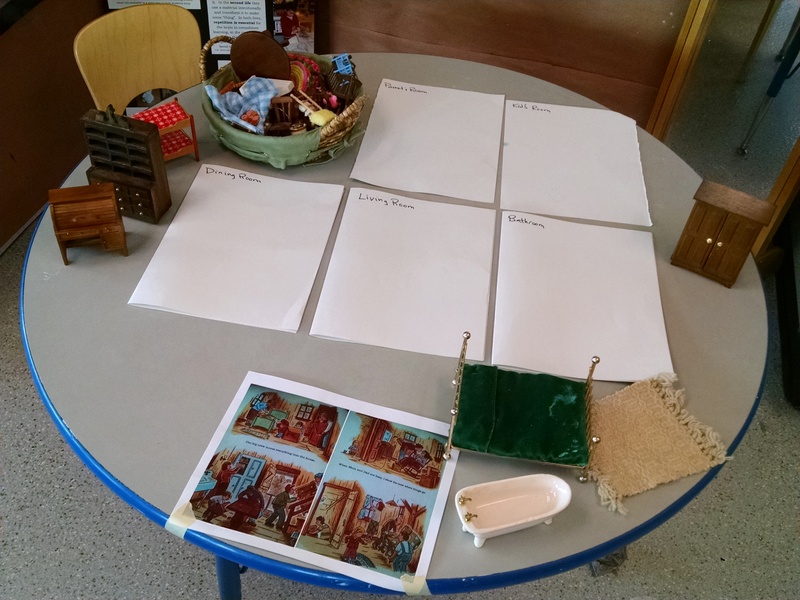 Sorting Activity – Arranging the Furniture. We had a collection of old doll house furniture (mine from childhood, that my parents just rummaged out of their basement!). We labelled 5 pieces of paper to represent the rooms of the house (would be better to have a blueprint of a floor plan) and kids sorted the furniture into the appropriate room. 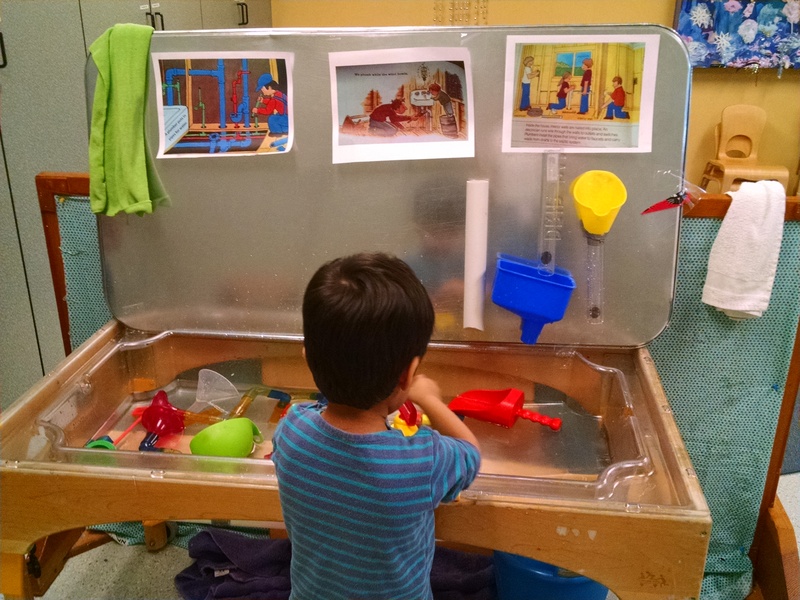 Sensory Table – the big dig: We had sand, buckets and shovels. You could also put out soil or brown cloud dough (flour, cocoa powder, vegetable oil) and bulldozers and dump trucks. We posted illustrations of bulldozers excavating house sites. Water Table – pipes: We posted pictures from our books of plumbers putting in pipes above the water table. We used elements from our DIY water wall and Waterway Pipes. Wiring – although we didn’t do this activity, you could also do something tied to the book pages about electricians wiring the house, such as Little Bits, Snap Circuits, or just a battery and an LED light on wires. See our Electricity lesson plan for ideas. 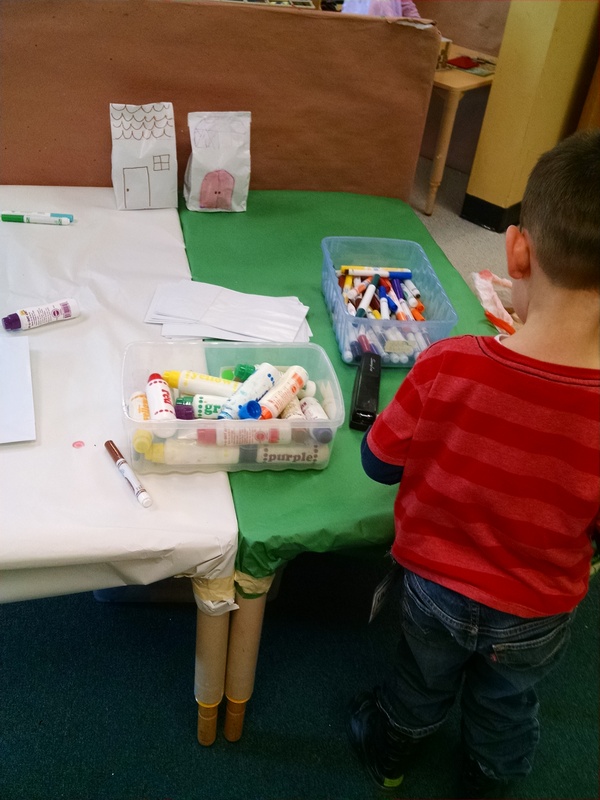 Creation Station: We have an area in the corner with miscellaneous supplies for spontaneous creations. 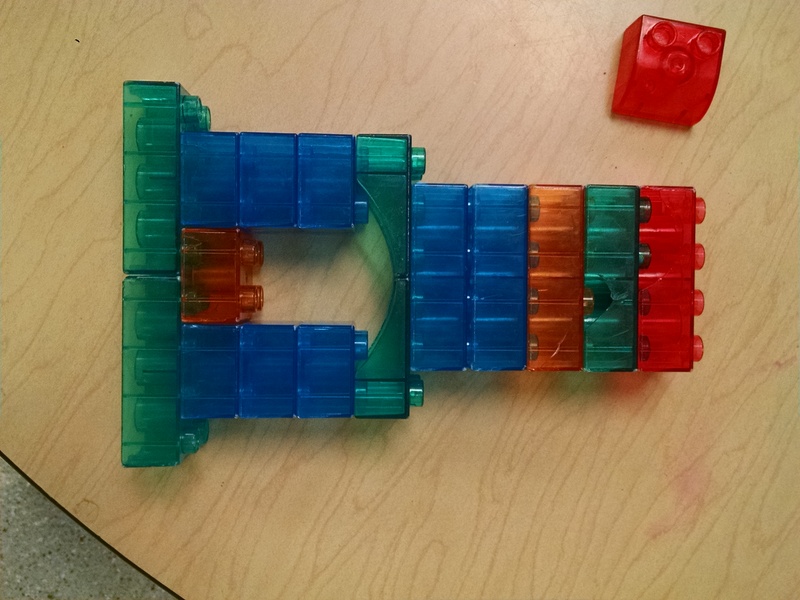 Some of our students decided to build rooms with tables and chairs. But, you could also do these verses to match the actions in the Barton book, in order. This would be great if your circle time is in the same room as activities, and on each verse, you can point around the room to the related activity. Imagination Activity: Give them paper to draw on. Encourage them to write or draw ideas for a house they would build. If they don’t want to write / draw, they can ask an adult to help. While they draw, put on music, do own sketches on board. After 5 minutes or so, ask some to share. Song: When I build My House by Parachute Express. www.youtube.com/watch?v=VBfJbbHJej0 (starred lines are done as call and response – you sing, they echo.) Mime the steps with rhythm sticks. I made posters of the lyrics that I printed on 11×17 paper. Book: Building Our House by Bean. This tells the story of a family building themselves a house. As you read through it, point out the signs of the seasons. They begin gathering supplies in one autumn, then stake out the location of the house in winter, begin to dig in spring, raise the walls in summer, roof in fall, finish the indoors in the winter and move into the house in the spring. The cat has kittens and the mom has a baby along the way!